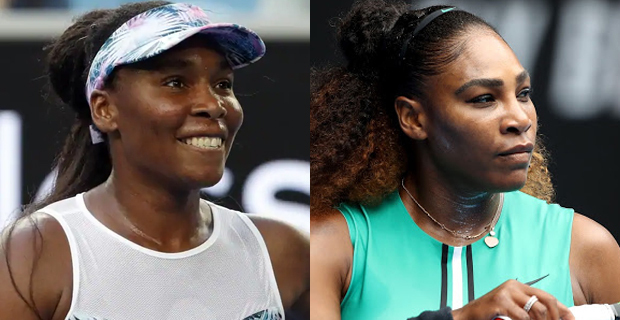 Serena Williams has made a ruthless start to her quest for a historic 24th grand slam crown, and she was followed into the second round by older sister Venus. Serena dropped just two games on the way to victory over Germany's Tatjana Maria, while Venus needed to draw on all of her experience to fight back from the brink against Romanian Mihaela Bu-zar-nes-cu. Serena will resume tomorrow against Canadian Eugenie Bouchard as she continues her chase for an eighth Open crown, which would draw the American level with Margaret Court with 24 major singles titles. Venus needed more than two hours to pull out the victory and avoid what would have been her fourth opening‑round loss in her past six appearances in Melbourne and she will now face France's Alize Cornet. Top seed Novak Djokovic showed he was back to full health and had little trouble getting past American qualifier Mitchell Krueger in three sets in his round‑one match. It sets up a second‑round battle with crowd favourite Jo‑Wilfried Tsonga ‑ a rematch of the 2008 Australian Open final, where the Serb won the first of his six titles at Melbourne Park.